This great graph from Reuters shows per EU country the government debt it had at the end of the second quarter, as a percentage of GDP. Since the crisis Portugal, Ireland have been accumulating debt at a high rate, while seeing their economy shrink significantly. This is shows in the government-debt-to-GDP measure, for which they are in respectively the third and the fourth place in having the highest government debt in the EU. 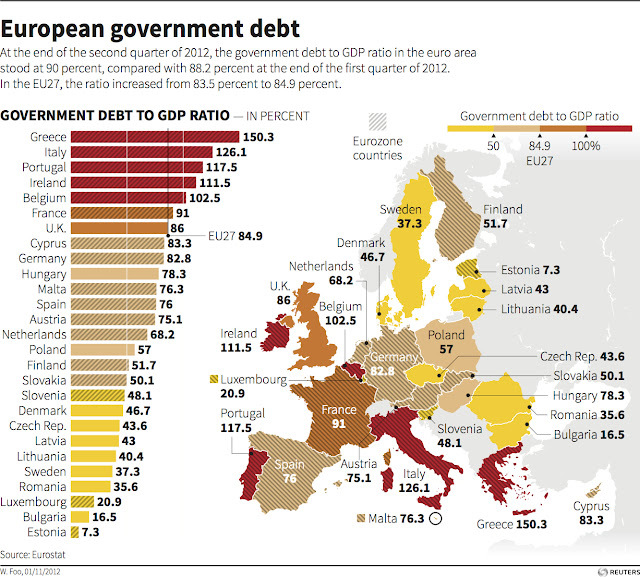 Estonia and Bulgaria have the lowest government debt in the EU. Thank you for updating. I'm glad to hear this news.